Restaurant Review: Two years in the making, Joli is housed in a former residence, with a contemporary American menu that is both a little Italian and a little French. It took two years of labor to birth Joli, a promising newcomer on a stretch of Northwest 65th Street already well-stocked with an eclectic array of bars and restaurants. During that time, partners came and went, and the original concept (a wine bar) was retooled and refined. In the end, three women did the midwifing: majority owner Janet Eicher, who co-owns the Ballard shop Chocolate Vitale; investor Molly Bostic; and chef Amy Beaumier. The strikingly austere restaurant and bar was carved out of a former residence. Gauzy lighting, velvet drapes on the large-paned windows and art — especially the serene triptych of snow-capped mountains painted by Seattle artist Carl Thomas Edwards — soften the urban-industrial shell of the storefront. Beaumier can eye it all from her compact mezzanine kitchen. Born in Korea, she was adopted as a baby by a Seattle couple and grew up eating eclectically. She describes her father as a curious cook and eater. Her mother is half-Japanese. The grandmother who lived with them cooked Hawaiian food; her other grandmother was obsessed with French cuisine. Her 10 years of professional cooking experience spans restaurants as diverse as Dragonfish Asian Cafe, Belle & Whete and RN74. Hours: dinner 4-10 p.m. Tuesday-Saturday; happy hour 4-6 p.m.
At Joli, Beaumier’s contemporary American menu leans a little Italian and a little French. She is nothing if not ambitious for a chef who is virtually flying solo. Thick, light wedges of house-made focaccia accompanied warm, citrusy green olives. Tender strands of braised rabbit, fresh marjoram and grated Parmesan clung to the ridges of her dainty, hand-formed ricotta cavatelli. A crisp-skinned fillet of black cod reclined on a bed of well-browned wild mushrooms alongside pillows of butter-slicked, leek ash gnocchi. 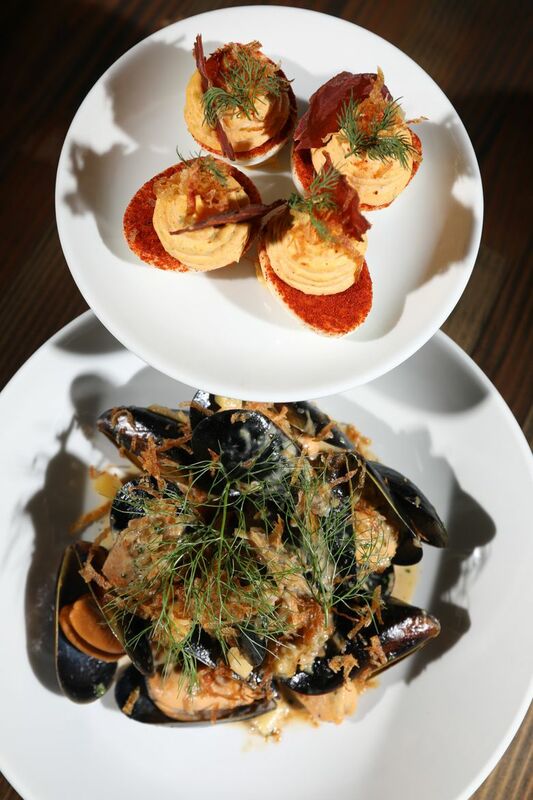 Mussels are steamed with sweet fennel and smoked potatoes, flavors distilled in a much-reduced garlic cream sauce brightened with preserved lemon. Those carefully thought out, well-executed compositions are among Beaumier’s best efforts and reason enough for neighbors to give Joli a try. Other dishes, though rendered with equally fine ingredients, proved less well-focused and more erratically seasoned. House-made seeded crisps punctuated a vanilla-tinged beet salad. The beets are prepared four ways — roasted, pureed, powdered and pickled — but the pickled ones made a scant impression. As with several dishes here, this one could have used more salt and pepper. Nicely caramelized rings of roasted delicata squash surrounded a plump, creamy bundle of burrata cheese. Paper-thin apple slices, fried sage leaves and huckleberry compote joined them. The resulting combo skewed very sweet without enough acidity or seasoning to strike a balance. I love that vegetables represent a big chunk of Beaumier’s menu. One of her partners is vegetarian and many of her friends are vegan, she told me in a phone interview. But she hasn’t quite nailed the knack of getting those plant-based ingredients to mingle felicitously without animal products. A vegan squash and mushroom ragu served over soft polenta didn’t quite merge into a coherent stew. The dish was bland; the delicata squash undercooked. The menu doesn’t label the vegan or vegetarian plates. Beaumier leaves it to servers to guide diners. Some do a better job than others. She hopes diners will be open to discovery. In that spirit, I ordered the egg-and-dairy-free chocolate mousse, instead of the chocolate pot de crème. The enormous bowl of chocolate pudding, ringed with sliced pears and figs soaked in red verjus, tasted more wholesome than you really want in a dessert, but I liked it better than cinnamon bread pudding that was light on cinnamon and halfway submerged in a soupy vanilla sauce. Leftover burger buns go into that bread pudding. Beaumier makes those too. The patty itself was curiously rubbery, but the brioche-like, sesame-seeded buns can soak up a ton of ketchup without disintegrating. Still (and I may be alone in this) I’d rather not have any ketchup on a burger that also sports aioli, Gruyere and caramelized onion. As an unabashed carnivore, I had high hopes for the fried pork cheek terrine, but all the flavor on that plate was concentrated in two sauces — one tart quince, the other sweet and sharp black garlic with mustard. Deviled eggs — olive-flecked, lavished with espelette pepper, crunchy with fried potato crumbles and waving a brittle flag of oven-dried speck ham — are definitely the better bar snack. Joli’s bar is likely to become a real draw now that Robert Rowland is behind the stick, after a decade at Oliver’s Twist. He brings warmth, charm and solid cocktail skills to the front of the house. Ask him to mix you a hot toddy one of these cold winter nights and you won’t be sorry. This story was corrected at 12:20 p.m. Jan. 12 to reflect that the restaurant only accepts reservations for parties of six or more.